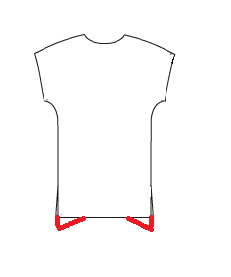 An individual's shoulder slope can have an impact on the fit of garments. Take a look at the photos above of Reese Witherspoon and Morena Baccarin. There is quite a difference between the two isn't there? Morena's extreme slope causes wrinkles to appear at the shoulders of some garments. Take note of the wrinkling across the shoulder line in the photos below. The other result of an extremely sloped shoulder shows at the hem of garments that hang away from the body. It creates the change from a straight hem to a curved one marked by red in the drawing to the left. Check back next week and I'll show my method for measuring shoulder slope accurately. Part 2 is here.